Thermal Oxidizers and Catalytic Oxidizers are typically used to destroy Hazardous Air Pollutants (HAPs) and Volatile Organic Compounds (VOCs) from industrial air streams. These pollutants are generally hydrocarbon-based and when destroyed via thermal oxidation, they are chemically changed to form CO2 and H2O. The National Environment Policy Act (NEPA) of 1969 established national policies and goals for the protection of the environment. The California Environment Quality Act (CEQA) was adopted in 1970. A local government agency, Air Quality Management District (AQMD) has primary approval authority over projects that have not previously undergone a CEQA analysis. The EPA and local AQMD often require these units for air pollution control to decompose hazardous gases before they’re released into the atmosphere. Thermal oxidation is usually accomplished in one of two ways, either by heating the effluent to a temperature high enough to cause spontaneous combustion in the presence of air, or by passing both the effluent and air over a catalyst bed that has been heated to a somewhat lower temperature sufficient to cause catalytic combination. Catalytic thermal oxidation is generally performed at a temperature approximately half that of traditional combustion based thermal oxidation. 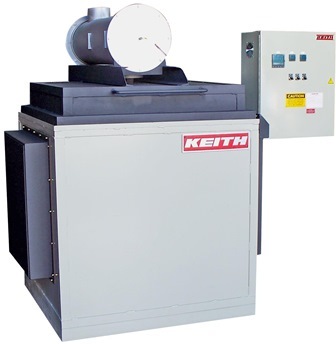 Keith Company provides both traditional high temperature thermal oxidizers and catalytic thermal oxidizers to a wide range of industries for the abatement of industrial VOCs. Many of these applications are thermal in nature. The VOC-laden gases are hot as they leave the process. Oxidizers apply additional heat, sometimes enhanced by the inclusion of catalytic materials, and provide means for achieving a specified gas residence time and, finally, discharge of the decomposed and oxidized process volatiles as carbon dioxide and water. The destruction efficiencies are in the range of 99%. Oxidizers are often integrated with our process heating equipment as a complete turn-key solution. The selection of an appropriate thermal or catalytic oxidizer begins with a thorough understanding of your process and exhaust chemistry. Our application engineer can help you determine the best solution to fit your specific requirements. Afterburners and thermal oxidizers may be integrated with Keith furnace systems or sold individually. Keith’s thermal oxidizers provide rugged, affordable and effective air pollution solutions to meet stringent regional air quality standards. 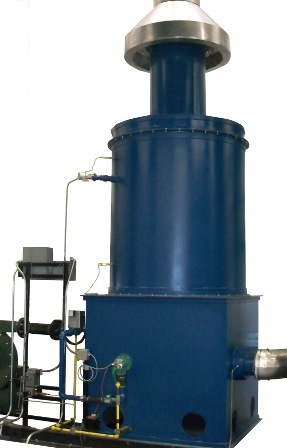 One of today’s most widely accepted air pollution control technologies across industry is a Regenerative Thermal Oxidizer, commonly referred to as an RTO. They are very versatile and efficient – thermal efficiency can reach 95%. They are regularly used for abating solvent fumes, odors, etc. from a wide range of industries. RTOs are ideal in a range of low to high VOC concentrations up to 10 g/m3 solvent. There are currently many types of RTOs on the market with the capability of 99.5 +% VOC oxidization or destruction efficiency. For large volume exhaust streams, they are the most practical and cost-effective solutions.